Carlton captain Marc Murphy making the announcement to a plane full of excited fans. Securing its second, long-term co-major partner in 2017, Carlton Football Club is delighted to announce a five-year partnership with Virgin Australia. Virgin Australia becomes the Blues’ co-major partner and official airline partner through to at least the end of 2022. Virgin Australia has been a platinum partner of the Carlton Football Club for the past three seasons, and earlier in the year signed as interim co-major partner. 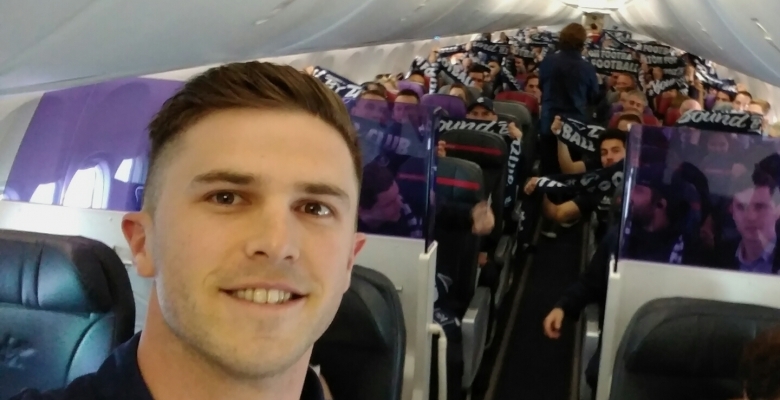 In an Australian-first, the announcement was made on Friday morning by Carlton captain Marc Murphy to passengers on flight VA827 Melbourne to Sydney and streamed live through the Carlton Football Club’s digital channels using Virgin Australia’s in-flight Wi-Fi. Carlton President Mark LoGiudice praised Virgin Australia’s strong relationship with the Club and said the Blues were delighted to have secured the partnership with one of Australia’s most recognisable organisations. “We are delighted to have broadened our partnership with Virgin Australia and to be sharing our growth with such a trusted and respected brand like Virgin Australia is incredibly exciting,” LoGiudice said. “It’s been a terrific period for our Club as we’ve secured two major partners in recent weeks on long-term agreements. We believe this speaks volumes about the direction we’re heading in as a football club and we thank both Virgin Australia and Hyundai Motor Company Australia for their continued support. “As they do for the entire AFL, Virgin Australia will continue to support our team in arriving ready when travelling interstate with their dedicated, premium service and staff on all flights. Virgin Australia Airlines Acting Chief Executive Officer Rob Sharp said: “The Carlton Football Club is a powerful and dynamic organisation with a strong corporate community and we are excited about the prospect of two strong brands aligning for a five-year partnership. “This partnership will continue to drive strong brand exposure for both organisations and we are thrilled to be a major partner of Carlton as we continue to broaden our commitment with both the AFL and its clubs. Virgin Australia will retain the front space on the Club’s away guernseys, as well as all major branding assets across the Club’s AFL program. Virgin Australia will also retain naming rights to all of Carlton’s premium match day hospitality events including the President’s Club by Virgin Australia and the Virgin Australia Carlton Lounge. Virgin Australia will continue to bring the brand to life for Carlton supporters as they did in Round 19 this season, sending a row of supporters at Etihad Stadium to Hong Kong in a unique match day experience. Carlton’s announcement with Virgin Australia follows a number of recent partnership deals for the Club in 2017, with Hyundai Motor Company Australia signing on as co-major partner for a further five years, as well as partnerships with Carlton & United Breweries, Ontime Group and Ikon Services.